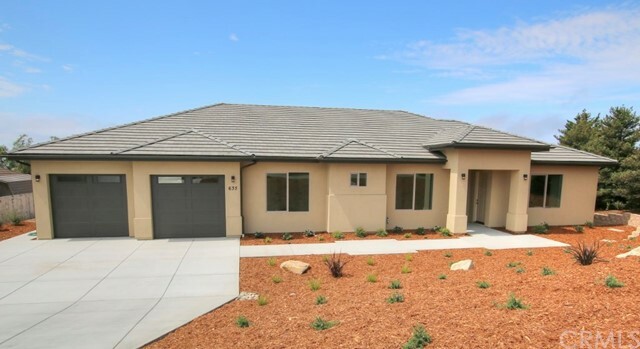 Brand New Single Level Home located on the beautiful Bluff Top of Nipomo with Gorgeous Views of the entire Santa Maria Valley and Pacific Ocean. This spacious 4 bd/3.5 ba home boasts approx. 2480 sq ft, open floor plan with 10 ft ceilings, Entertainer&apos;s kitchen with stainless steel appliances, Quartz countertops, Wine Fridge, Large Pantry, Double Ovens, Dishwasher, Microwave, Center Island and Large Stainless Steel Single Basin Sink, there is also Indoor Laundry and a 3 Car Garage that opens at the rear taking advantage of the views. Custom cabinets and Quartz and Marble countertops thru out, tile flooring in baths and laundry room. Gorgeous wood floors in entry, kitchen, living room, hallway and master bedroom, carpet in other bedrooms. One of the bedrooms has a separate entrance, wet bar and own bathroom, could be in law quarters or short term rental. Full front yard landscaping and located on a quiet cul de sac. No HOA and NO HOA Dues. This home is move in ready, bring your most discerning clients, they won&apos;t be disappointed!